Click the image above to see a larger photograph. The Featured Barn for September is depicted above in a painting called "Rare Pair" by Carson. 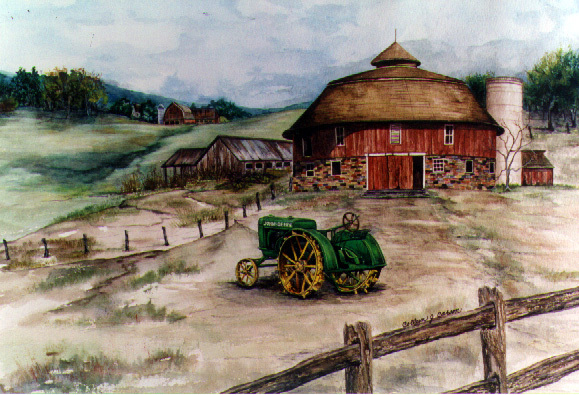 The full painting features the tile round barn with a John Deere "C" tractor in the foreground. An architect / builder by the name of Benton Steele was actively engaged in building these barns in Indiana, Iowa, Wisconsin, Kansas, and Illinois between 1907 and 1923. He reached beyond trade journals for the broader readership of agricultural newspapers and contributed to numerous midwestern papers, illustrating his latest round barn designs. His office was in Pendleton, IN until 1909 when he moved to Halstead, KS. One interested farmer was dairyman Charles Nebergall of Blue Grass Township in Scott County, IA. He had somehow learned about one of Steele's barns being built for a man named Hollenbeck near Casey, IA, and decided to see it for himself. Having recently lost his own square barn to a tornado and hoping to replace it soon, he took the Rock Island train to Casey, rented a horse and buggy from the livery stable, and headed southwest out of town. When he arrived at the Hollenbeck farm, three miles away, what he saw being consructed impressed him. He immediately hired Steele and his traveling crew to build a round barn at his own place, albeit one of different design from the basement-ramp barn at Hollenbeck's. What had led Nebergall to contact Steele in the first place? Perhaps he had read one of Steele's articles published in Kimball's Dairy Farmer (Waterloo), the Breeder's Gazette of Chicago, or Hoard's Dairyman (Fort Atkinson, WI). Steele and the Kansas crew lived with the Nebergall family during the spring of 1914 while erecting a handsome 56 foot diameter barn. It combined first-story walls of clay-tile with second-story walls of wood frame sided with vertical board and batten. Steele and his crew built four more barns that summer season. This beautiful barn is the only known example of Steele's handiwork known to still exist in Iowa. Back to The Barn Journal front page.